While the Wii U may not have been the most popular console, what with the lack of third party games, one developer saw to it that the console would have some top quality games in the form of their Mass Effect 3 and The Legend of Zelda: Twilight Princess ports and now for the year of 2017, Tantalus Media are bringing 2 great games to the Nintendo Switch! So eager to learn more about Twilight Princess HD and a few of their other projects, we contacted Tantalus Media CEO, Tom Crago, asking for an interview and he said yes! So brace yourselves because that interview happened and today we’re sharing the answers, which cover everything from Mass Effect 3 to the upcoming RiME and Sonic Mania! I hope you’re comfortable, because there is a lot to read! In typical interview fashion. Would you mind introducing yourself to our readers and tell us a bit about the ever great Tantalus Media? Tom Crago: Absolutely. I’m Tom Crago and Tantalus has been around since 1994, which makes us one of the oldest independent game development studios in the world. We’ve shipped nearly fifty titles, on pretty much every platform since the SNES, and across a whole range of genres. We’re nothing if not diverse. Over the years we’ve had a particular affinity for Nintendo platforms, which continues to this day with the Switch. Miketendo64: It goes without saying you have brought some quality games to Nintendo platforms over the years. Were there any games you tried to but couldn’t? Tom Crago: Oh absolutely. But we don’t talk about those. And it’s rarely a matter of ‘couldn’t.’ More than for, whatever reason, our publishing partners decide to go in a different direction. Miketendo64: Purely because a very dear friend of mine is a huge Mass Effect fan and would kill me if I didn’t at least try to talk about it, how did the Mass Effect 3 port come to be and how did you find porting it to the Wii U? Tom Crago: We’d been admirers of BioWare for a long time and actually came close to working with them on the DS a number of years ago. Richard and Greg, the Founders of the company, both visited Australia and so I had an opportunity to get into their ears about how much we’d love to collaborate. Beyond that Tantalus did Unreal II on Xbox, so we had some experience with challenging conversions, and with the Unreal engine, and of course a great relationship with Nintendo. So when BioWare wanted to bring Mass Effect 3 to the Wii U I suspect we were on a fairly short list of developers they took it to. The planets obviously aligned, as we were able to convince them to trust us with their baby. Miketendo64: And because Andromeda released this year, were EA and BioWare to decide Switch would be a good fit for Switch after all and wanted someone else to handle the port, would you and your team be willing to dip your toes back into the Mass Effect universe and take on such a project? Tom Crago: Now that would be a cool project, although not one without its share of technical challenges. Miketendo64: As great as it was though, Mass Effect 3 wasn’t your only biggest port to the Wii U, because you also ported and remastered Twilight Princess HD. I know you have talked about this a few times now in the past, but for our readers who never read the story of how it came to be, would you please tell us how the port happened in the first place? When did development for it begin and what was your most favourite moment from the whole process? Tom Crago: Definitely it was a huge title, and one of our proudest achievements as a company. We had worked with Nintendo before on Top Gear Rally on GBA, and had remained in close contact in the intervening period. I guess they were impressed by the work we’d done on Mass Effect 3, which was a launch title on Wii U, and so they approached us to talk about Twilight Princess. It’s not every day someone from Nintendo asks you if you’d be interested in making a Zelda game, so definitely it was happy moment. By that stage Tantalus had shipped around thirty games on Nintendo platforms, and so certainly it felt like a natural fit. A huge thrill, but a natural fit. We worked with Nintendo very closely. A dedicated team in Kyoto worked with us throughout the duration of the project, and senior members of our team made several trips to Japan. My favourite moments were definitely those visits to Kyoto, especially spending time with Aonuma-san, and having the opportunity to present our ideas for the game. Miketendo64: Purely because another friend of mine asked me to ask this (this is for you Lucas), Twilight Princess is without a doubt something of a dark and emotionally moving game, much like Mass Effect 3. How did it feel to be able to be part of something like that and work on those two games? Tom Crago: Yeah they’re both titles with an air of the ‘epic’ about them, aren’t they? It’s wonderful to work on games that move people. The medium of video games has a unique capacity to do that, in my opinion. Miketendo64: Curiosity may have killed the cat, but curiosity is part of human nature, so in light of that, although Twilight Princess HD was designed for Wii U, have you or your team tried seeing what the game would look and play like if you brought it to Nintendo Switch? Not for release or anything like that, but just to see how easy a Zelda game would transition over to Switch from 3DS? Tom Crago: We have not. We have a lot on at the moment and so not a lot of time for experiments. Miketendo64: And because we’ve asked about one Zelda game, would you ever work with Nintendo again about porting/remastering another Zelda game, such as doing a Skyward Sword HD for Switch? Or even a Link’s Awakening/Ocarina of Time port? Tom Crago: We always want to work with Nintendo. Miketendo64: Neither a yes or a no. Interesting! Miketendo64: Not only had you brought a Nintendo classic back to life, like Shovel Knight developers Yacht Club Games, you too got to work on a game that used amiibo and done so in such an interesting way. Who came up with the idea of the Wolf Link amiibo and how did you find the process of incorporating amiibo with Twilight Princess HD? Tom Crago: The Wolf Link Amiibo was added fairly late in the development cycle, and I believe it was Aonuma-san’s idea. He phoned me one day to ask what we thought about it, and whether we’d be happy to add it to the game. I don’t think he’d finished his sentence before I responded overwhelmingly in the affirmative. Miketendo64: And given what you know now about amiibo, would you consider working with them again. For example, as far as Switch goes, one of the games you are working on is Sonic Mania. Is there any chance Tantalus will include some amiibo support for the Switch version of the upcoming release? Tom Crago: Absolutely we’d love to do more with Amiibos. No plans just at present, though. Miketendo64: Also because I’ve brought up Sonic Mania, how did you first get involved with the project and how is yourselves and your team finding working on the game? Are you still all set for a Summer release? Tom Crago: Here again SEGA initiated the conversation. We made a couple of games with them back in the 1990’s (maybe before some of your readers were born) and had maintained a close relationship. It was an easy negotiation and we started working with SEGA and Christian Whitehead last year. The game is really Christian’s baby, but we’re loving bringing it to Switch. Yes it’s on track for a summer release. Miketendo64: And purely because not everyone has learned about Sonic Mania yet, just what kind of a game is it exactly and what modes and crazy content can our readers expect to enjoy when they play it later on this year? Tom Crago: Sure, well the game takes us back into the world of 2D platforming, with pixel art and the kind of classic gameplay we all loved in the original Sonic, and in games like Sonic CD. There are new Zones, too, with all-new Acts and boss fights. You can play as Sonic, Tails, and Knuckles. Miketendo64: Only as far as Sonic Mania is concerned, it was previously stated that Sonic Mania is a game for the fans, whereas Sonic Forces is a game for everyone. As someone working on the game and able to play it to test it, how true do you find that statement? Is Mania for the fans or do you feel it is for everyone? Tom Crago: Speaking from a personal perspective, I don’t think you will need to have played an older Sonic game to have a great time with Sonic Mania. Miketendo64: But Sonic Mania isn’t the only game you’ve got lined up for Switch as you are also working on Tequila Work’s RiME. How did that come to be? Tom Crago: RiME is a really exciting title. Tequila Works have put their heart and soul into that game and it is looking fantastic. Again we were approached based on our experience on Nintendo platforms, and our job really has been to reproduce the title as faithfully as possible, from the console version. It’s such a beautiful game, there’s no need to mess with it. Miketendo64: Compared to the various other titles Tantalus Media has worked on other the years, as the man with inside information, how does RiME compare to the other games you’ve worked on and what do you personally make of the game? Tom Crago: It really is a pretty unique game, both in terms of how it looks and the themes it explores. You’ll need to play it appreciate it. Miketendo64: Having worked on Twilight Princess HD rather closely with Nintendo that must have earned you guys a ton of brownie points with the Big N. So much so to see you equipped with your very own Switch dev kit. When did you first learn of the new Nintendo platform and how long have you had the kit in your possession? Tom Crago: We were fairly early to the party, which was nice. One of the best days in our studio is when we get to open up a shipment of new development kits. In a way its like ‘starting again’ in terms of technology and game design, but that’s one of the things that makes game development so exciting. Miketendo64: Since everyone else has talked about it, we may as well let you have your chance to do the same. Given all the platforms you have brought games to, how has Tantalus Media found working with and developing for the Nintendo Switch? Tom Crago: Nintendo made a lot of smart decisions with the Switch. It’s easy to write code for, and from an architecture standpoint it’s straightforward. I like the form factor too, it’s a great piece of hardware. Miketendo64: Since a ton of Tantalus Media’s time is spent porting games, just how much control do you have over the games you are working on? Enough to add a new idea or two like with Twilight Princess HD, or is this more of a case by case sort of thing? Tom Crago: Oh absolutely we pitch a ton of ideas, on every port we undertake. We always strive to make our version of a game the ‘definitive version.’ And at Tantalus we’ve always worked on original titles, too. We have one or two in development right now. Miketendo64: I sure like the sound of that! Miketendo64: Taking a step back from all the developing and porting talk, let’s talk about you, Tom Crago the gamer. Other than play testing the games during development, do you play them post-release and just what kind of a gamer do you class yourself to be? And what sort of games and series’ do you enjoy most? Tom Crago: I play a lot less games than I used to. Naturally I try to play the games we’re working on, but beyond that I mostly spend times with what our industry calls ‘art games.’ I don’t really like that term, but I’m sure your readers will know that kind of titles I’m talking about. I’m also into VR right now. Miketendo64: Most important question of them all though, which console is your favourite of all time and because I’m nice, you can even pick one Nintendo console and one non-Nintendo if you want to? Tom Crago: Can I choose the pinball machine? Miketendo64: Back to all that other stuff though, other than RiME and Sonic Mania, does Tantalus Media have any other Switch games on the go at this moment in time and are there any you can also publically talk about? Tom Crago: Nothing we can talk about but rest assured there will be more Switch titles from Tantalus down the track. Miketendo64: What you and your team have been able to achieve this last decade alone has been truly incredible. You’ve put yourselves out there and soared to new heights, so since the bar has been raised, what does come next for the great Tantalus Media? Tom Crago: We want to keep improving and to continue to find an ever-expanding audience for our titles. A lot of that comes down to quality, and we’re very motivated to raise that bar. It’s also really important to me that everyone who works here comes into the studio and has fun. In a sense I value that more than a metacritic score. Beyond that we want to work on more original titles, as a way of better showcasing our art and game design talents. Miketendo64: Tom, thank you for taking the time to answer these questions you have been an absolute star and so I won’t take up any more of your valuable time, this is the final question. Is there anything you would like to say to your ever growing fanbase and supporters? Tom Crago: Thanks for letting me and my team have the best jobs in the world. We really couldn’t do it without you. 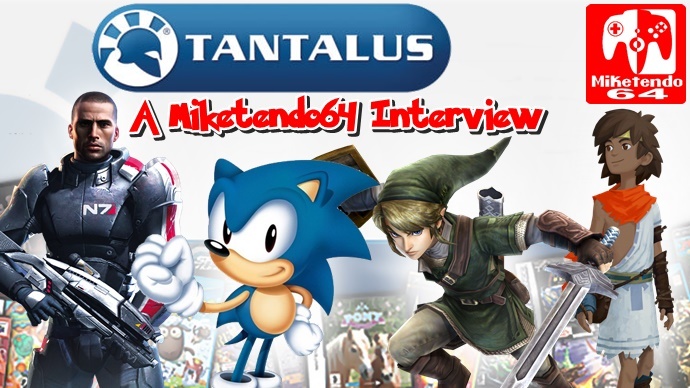 On behalf of the entire Miketendo64 site, thank you for gracing our site with your presence and being the latest dev we got the chance to interview! Best of luck with those original games you have in development Tom! I hope we get them on Switch because I never want to stop playing games that Tantalus has worked on!